Gather family, friends, coworkers, club members, church groups or sports team members and rally them together to reach a collective fundraising goal. Register your team today. Use the Participant Center to monitor your team's progress and send messages to friends and family to appeal to them for support. The more people on your team, the more creative ideas you may have for fundraising! You can also keep each other motivated and continue your great work until you reach your team goal. Here are some documents to help you in your fundraising efforts. 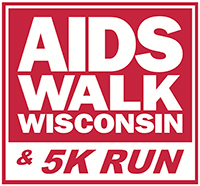 Learn more about Team Challenges for AIDS Walk Wisconsin & 5K Run 2019 by clicking the logos below.